The Customization panel is available for your convenience. It is located in the right sidebar when you are in your form Settings or a View. It can be used to insert fields, add conditionals, get information from a linked entry, etc. Some of the tabs in the sidebar are disabled until the cursor is in a box where the shortcodes can be used. The Insert Fields tab is used to insert fields and other helpful shortcodes. The Fields from your form section displays a clickable list of field IDs and Keys from the associated form. The Helpers section contains a variety of helpful clickable shortcodes. For more information on the Insert Fields tab, visit the Insert Fields page. 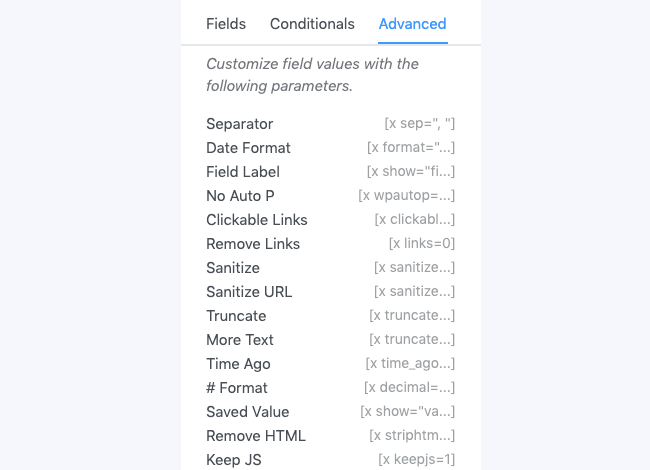 The Conditionals tab is used to insert conditional statements, which conditionally hide or show content based on a specific field's value. These can be used in a View, email notification, confirmation message, or redirect URL. This tabs remains disabled until your cursor is in one of the settings boxes where conditionals are allowed. The Helpers section contains a variety of buttons to help you build more advanced conditional statements. For more information about conditional statements, visit the Conditionals page. The Advanced tab is used to insert a variety of helpful shortcodes. For more information on the shortcodes available in this section, visit the Advanced page. This tab will only be available when you are in the 'Customize HTML' section of your form. The buttons in this panel can be used to insert simple shortcodes which will make it a little easier to customize your form. Read more: HTML tags to customize form HTML.